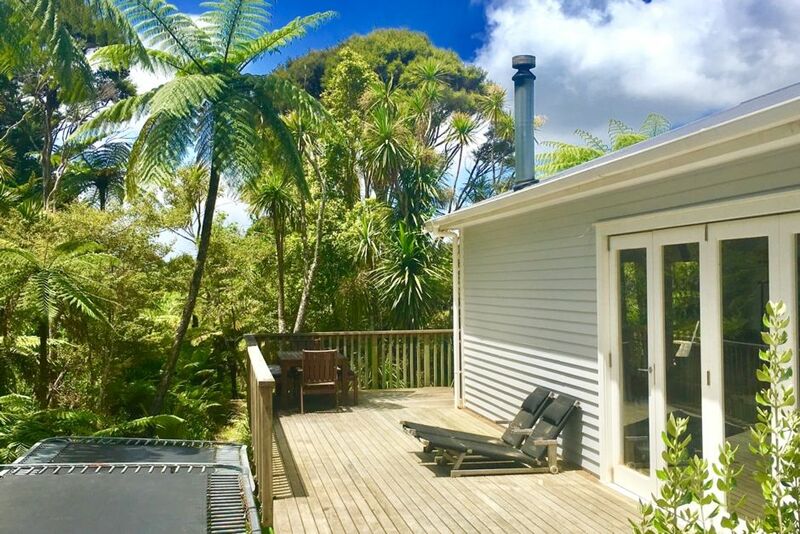 A peaceful spot nestled in the Waitakere Ranges. It is surrounded in native bush in this rural setting. You will enjoy the native birds and the sunshine that floods into the living areas. Perfect for total relaxation. Large decks on the East + North facing sides of the house with an outdoor table and chairs + a BBQ to enjoy being al fresco. A very sunny north facing bach. The Master Bedroom has a queen sized bed and an ensuite with a brand new tiled shower, vanity and toilet. There is a Double Bedroom with 2 single beds. There is a Single Bedroom with 1 single bed and 1 floor mattress if need be. The bathroom has a large vintage claw bath, vanity and toilet but no shower. Native Bush all around the house so no backyard as such, but there are 3 trampolines for children to enjoy and lots of bush and trees! Closest bus stop is at Parrs Park. Beautiful house, mostly well equipped, great relaxing location. Fantastic bath with beautiful herbal bath salts provided - which we appreciated. A couple of small things that would have been nice - bedside lamps in each bedroom not just master, bluetooth speaker as stereo was older style and no cd's in house and couldn't plug in phone. Driveway was difficult to get up - our Captiva hire car could not grip the gravel so ended up parking on the street which wasn't an issue as weather was lovely but something to note. Beautiful space to relax away from the city. All necessities for a comfortable stay provided. Really enjoyed our time and highly recommend. Clean, comfy beds, had everything we needed for a lovely relaxing, quiet visit. Thank you. Would love to come back in summer, what a beautiful location.